From sports clubs to charities, AKA always like to be sponsoring someone, whether that be our local football team or an appropriate charity! We also actively take part in fundraising campaigns and contribute to the fundraising efforts of our colleagues and friends. To see our latest ventures, please click here to see our blog. Matt Mills is a central defender on the first-team squad since his transfer to Forest in July 2015. 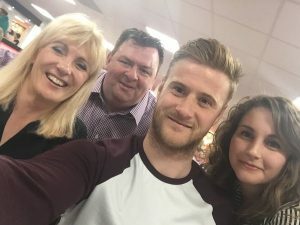 Throughout his career, Matt has worked for various football clubs, which has included being team captain for both Leicester City and Bolton Wanderers. He has also represented England at various ‘Under’ age levels. As part of our sponsorship with Forest, we get the opportunity to have lunch with our sponsor player, so in 2016 we met the man himself. We found Matt to be very personable and chatty and really enjoyed meeting him and several other Forest players. He even took the selfie for us! To visit his Forest profile, click here. For a number of years now, AKA have supported Dogs For Good (formerly known as Dogs for the Disabled) by sponsoring a puppy. 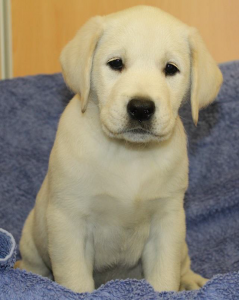 Sponsoring a puppy provides funding for their first year of training to become an assistance dog. DFG are a charity that train assistance dogs to help disabled individuals of all ages lead more independent lives. They also train therapy dogs and specialist dog handlers to enable them to work within the community and schools to help individuals overcome challenges and improve their lives. See more about what DFG can do to help people by clicking here. Mungo is a cute and very lively golden Labrador x Golden Retriever, born in February 2016. Now 11 months old, Mungo is growing in strength and confidence. His socialiser and puppy co-ordinator both report that he is doing very well in training, and is both enthusiastic and energetic. He has been tested in various different environments, such as a train and school assembly, and passed with flying colours! His favourite things include puppy classes, puzzle toys and eating squeezy cheese. We can’t wait to hear whether he passes his training in a few month’s time!